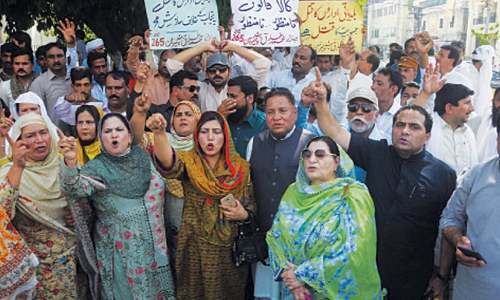 LAHORE: Despite facing various inquiries in the National Accountability Bureau (NAB), the Lahore Development Authority (LDA) administration continues appointing non-technical and junior officers on high and prime posts allegedly in violation of the seniority and merit policy. In an interesting case, a non-technical officer from the local government service was brought to the LDA on deputation and assigned the responsibility of director (commercial)—an important post that requires a professional town planner. Similarly, regular BPS-17 officials have been appointed as directors in BPS-19 on an officiating basis despite availability of the BPS-18 officers, it is learnt. Sources in the authority mention filling of the vacant post of director (commercial) with appointment of Iqbal Fareed—a non-technical BPS-18 officer from local government service. “Mr Fareed joined the LDA on a deputation basis sometime back. On joining the authority, the administration appointed him as director (commercial)—an important job that deals with the crucial issues of commercialisation in Lahore. The post requires a town planner but Mr Fareed doesn’t have the required qualification,” an official source told Dawn on Thursday. “What will a non-technical officer do at a technical post? It is also a first case in the history of the LDA,” he added. In the past, it was a routine practice in the LDA that charge of BPS-18 posts of deputy directors (DDs) was given to regular BPS-17 assistant directors (ADs). But a new style of governing the LDA was introduced with entrusting BPS-17 ADs with additional charge for the posts of directors (BPS-19) besides continuing with the acting charge of the DDs. “Salman Mehfooz (a regular BPS-17 AD) was appointed as director (town planning-III)—a post that deals with the town planning issues of private housing societies/schemes in Lahore. Similarly, Sumaira Ali (AD in regular BPS-17), who was already enjoying charge of deputy director, got the additional charge of director (recovery) in town planning wing,” said the official source. AD Muhammad Kamran was entrusted with the additional charge of director to director general. He also continues holding the post of DD in BPS-18. Muhammad Iftikhar was assigned the responsibility of director (metropolitan planning), he continued. “The question is that why the LDA has made the abovementioned appointments absolutely against the seniority and merit policy,” the source asked. “There are many regular BPS-18 officers serving in various LDA wings/directorates. But the admin appointed the most junior officers of their choice on higher posts. Such decisions are really hurting the regular BPS-18 officers. In this situation, they are also forced to report to their juniors who are enjoying the post of directors,” the official explained. LDA Additional Director General (Headquarters) Samia Saleem rejected the reports, claiming that administration always preferred those who could take initiatives and deliver. “Mr Fareed has been posted at the most important job—director commercial—since the post demands service delivery in a quick and honest way,” she said. The authority appointed ADs as directors on the basis of performance and not seniority while the some senior officers, including BPS-18 DDs, don’t want to perform or deliver, she added. “Another reason for posting ADs as directors is shortage of officers (DDs and directors) due to retirement of some officials. Besides, the new recruitments too were not made in the past,” Ms Samia said while justifying the postings in question. According to a spokesman for the LDA, there had been no recruitment of officers in the authority from 1996 to 2009. All the assistant directors employed in the LDA during the mid-1980s to mid-1990s had either retired from service or promoted as directors long time back. The spokesman added that the LDA had also undergone expansion during the past one decade. Its jurisdiction had been extended to the entire Lahore division besides there an increase in development activities. To meet the new challenges, he said, the young officers were posted on higher posts and they have justified their posting through performance.